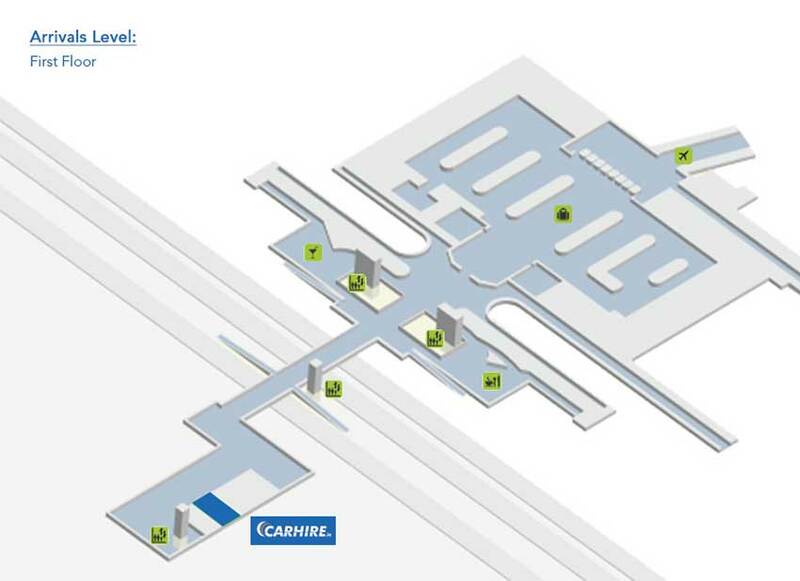 Above you’ll find a map of Terminal 2, courtesy of Dublin Airport Guide, which outlines where you can find our desk so we can get you on your way as quickly as possible. Once you enter the arrival hall simply follow the signs for car rental and you’ll soon find CARHIRE.ie at our desk which is partnered with Europcar. Our friendly staff will be ready to help you on your way. Terminal 2 features a wide range of facilities and amenities. Useful resources include internet and printing facilities, baby changing facilities, dedicated medical staff, reduced mobility services and play areas for children. Once you pass through security you will enter the loop, an area packed with shops which includes duty free shopping. More info on the loop can be found here ( http://www.theloop.ie/ ). Once you’ve passed through the shops you’ll find a range of restaurants that offer top quality food and drink services for you to avail of while you wait for your flight. These facilities are some of the most modern in the world as Terminal 2 was built as recently as 2010. Security in Terminal 1 is located on the first floor departures level. Airport authorities recommend that you arrive 90 minutes in advance of your scheduled departure time to allow time for queues at the security check and check in desks. We advise allowing an additional 30 minutes to return your rental car. The list of prohibited items includes sharp or pointed items including tools, knives, darts and scissors; flammables; and sports equipment such as cricket bats and billiard cues. The main thing that slows people down is the EU regulation to do with liquids which states that you should place all containers of liquids and gels into a single re-sealable clear plastic bag no larger than 20cm x 20cm. EU regulations prohibit the containers from exceeding 100ml in volume. Having this prepared in advance and also having your electronics such as laptops and tablets close to hand as you will be asked to remove these from your luggage. We have put together a more in depth explanation about prohibited items and liquid regulations here. Anyone flying to the US will want read up on Terminal 2’s US Pre-Clearance facilities. Passengers can complete all necessary emigration information in Dublin prior to boarding their flight in Terminal 2. As a result all passengers arrive as a domestic passenger and simply have to pick up their luggage and they can be on their way. This not only means less waiting in the US heat but also opens up a host of new possible destinations in the future for Irish passengers. The official opening was in 2011 and Dublin Airport has become a major hub for transatlantic travel to the US. Terminal 2 has a range of transport options to avail of. Public bus routes are available from Dublin City and nationwide locations. There’s a taxi service found right outside the terminal as well as a choice of car rental companies in Terminal 2 where you’ll find CARHIRE.ie and our desk partners Europcar offering you a great fully inclusive service at Dublin Airport T2.